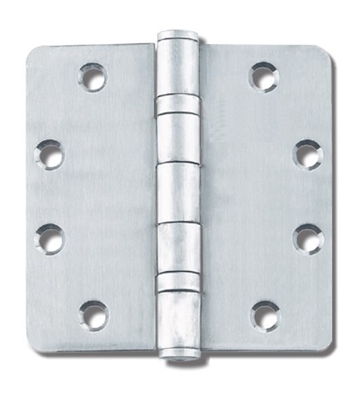 Ball bearing hinges support the weight of commercial doors and act as a pivot for the door. The entire weight of the door is distributed to three ball bearing hinges. That is why it is always important to install durable, heavy duty, and reliable commercial ball bearing hinges. Installing inferior door ball bearing hinges could lead to premature failure. At Automatic Door and Hardware we are proud to offer the best in quality and selection of ball bearing hinges for commercial doors. We carry trusted ball bearing hinge brands such as Bommer Ball Bearing Hinges, Cal Royal Ball Bearing Hinges, CR Laurence CRL Ball Bearing Hinges, US Aluminum Ball Bearing Hinges, and many more. There are many ball bearing hinge models to choose from. We carry wide selection of ball bearing hinges and offer many ball bearing hinge models, ball bearing hinge finishes, ball bearing hinge types to select from. So please choose the ball bearing hinge you require for your job, and we will gladly ship the ball bearing hinge right to your location. Automatic Door and Hardware is an authorized door hinge dealer for the top door hardware brands in the industry. As a result, we can offer a lifetime warranty on many ball bearing door hinges including Cal Royal and Hager. So order all the ball bearing hinges you need at Automatic Door and Hardware and we will quickly ship them out to you.